Good news for Mass Effect fans, EA and BioWare have announced a trilogy collection coming later this year. As you can guess, this trilogy includes all three Mass Effect games in one collectors box set, seen below. 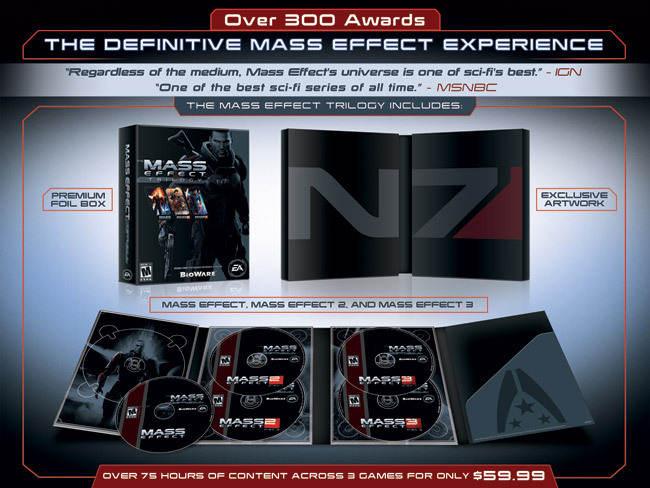 Good news for PS3 owners, Mass Effect will now be available for the first time ever in this special box set on the PS3. Since the first game in the series was published by Microsoft, it has yet to be released on the PS3 and has only be available for the Xbox 360 and PC. The Mass Effect trilogy will be available on November 6 of this year for the price of $59.99 for the Xbox 360 and PC. The PS3 version will be available at a later date but I assume it will be the same price. Awesome news for those of us who are both Mass Effect fans and PS3 faithful. ERMERHGAWD now….I will buy Mass Effect. More incentive to get a PS3, right? You can have all 3 now!